I didn't realize being pregnant was such a handicap especially when everyone in LA valets. When my friend was pregnant with her first child some heart problems surfaced that she hadn't known about. Because of this she had to get a handicrap parking sticker, too. It is not her personal vehicle that she is driving. That is her friend's vehicle that she was rushing to the ER. 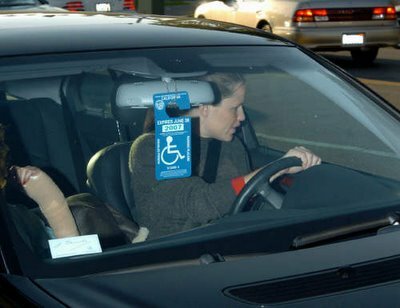 this isn't uncommon, when you're that pregnant most DMV's will issue a pregnant woman a temporary handicap privelege for parking. yeah I was pretty sure that when I put the pic up that that car wasn't her's and yes most pregnant women do deserve good parking spaces. i don't want you guys to think I am totally crazy! Heck with the handicap parking permit...someone needs to tell ehr that CAFFEINE is not good for an unborn child. Ben and Jen can whore themselves out to Starbucks all they want but it looks bad seeing her chug Starbucks all the time. that pic is really funny. We have parking lots around here with Stork spaces for pregnant and new moms. They rock. But Jen has had the baby (Violet Ann) so she'll have to forfeit that placard in favor of lugging a baby everywhere.